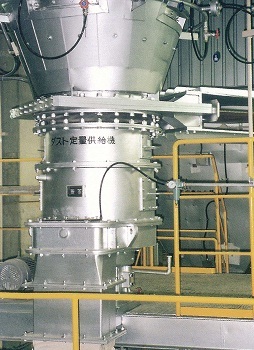 ELCF Type Smooth Auto Feeder｜PRODUCT｜Global Materials Engineering Co., Ltd. 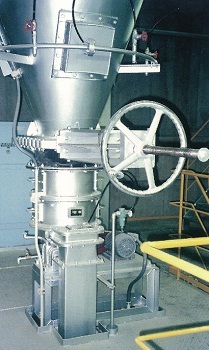 This machine provides a stable feed of various kinds of dry powders. Our feeders scrape powder from a container and batch it by volume, which allows for high accurate, stable feeding for a wide variety of dry powders. 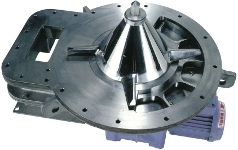 Use of our tightly sealed Encircle Disc allows for stable feeding of highly fluid powders as well. 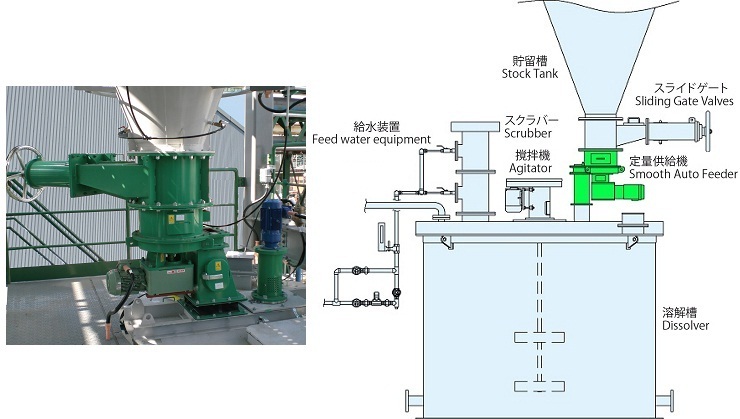 Use of a spout (powder-pressure reducing device) enables high accurate feeding thanks to its special construction that is unaffected by highly variable specific gravity from the powder pressure. The unit is constructed for different powder properties for stable feeding of fly ash and other adhesive powders, and cement, sodium bicarbonate, and other firmly adhesive powders. The ELCF Type Smooth Auto Feeder is a highly reliable quantitative feeder that continuously and accurately feeds powder or grain to the next process. 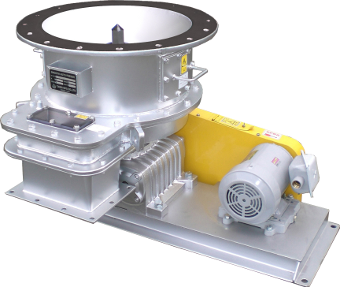 Its use of a tight-sealing Encircle-Disc (scrapes powders and grain from a container and batches them by volume) allows for stable supply of even highly-fluid powders. Our reliability and expertise, cultivated for over 50 years, can be found in each and every one of our products. Our feeders enjoy high praise in pollution control facilities; the chemicals industry; the steel, refining, and metals industries; the paper industry; the food industry; and numerous other industries. 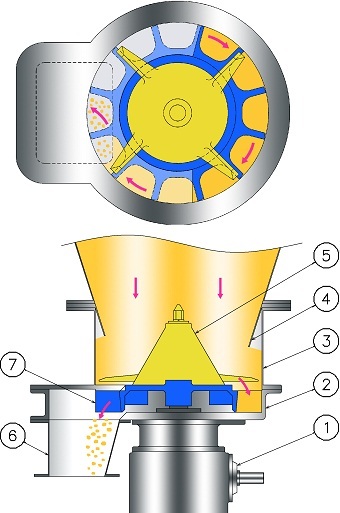 The accumulated powder is kept at a set powder pressure in the spout (4) (powder-pressure reducing device) installed at inlet in the lower vessel (3). It is then deposited inside the feeding table (7) in a homogenous, uncompressed state by the agitator. 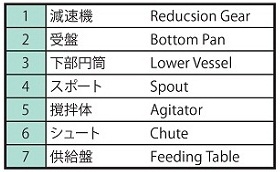 The powder deposited inside the feeding table (7) is scraped to a set volume, and then fed to the chute (6). The inverter can vary the rotation speed to adjust feed rate. which need reliable concentration control, in dissolution equipment, such as factory drainage treatment/neutralization equipment and other water treatment equipment at treatment plants.